» Guest blog: Keep on keeping on! Guest blog: Keep on keeping on! 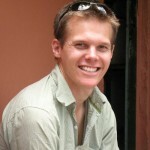 Today’s guest blogger is Alex Hawke, a mission worker in Cambodia. You can follow him on Twitter at @AlexGTHawke. As those serving cross-culturally we face a whole variety of things that can distract, frustrate, upset or disappoint us. At times we may feel really discouraged and be tempted to give up. Like you I’ve faced some disheartening circumstances and various challenges to my faith and call, even recently. I often return to Hebrews 12:1-3 where we find both stunning reasons to keep running our race and some ways to do that. Whether we’re doing fine or experiencing deep discouragement or uncertainty I hope this will be fuel for the journey, some help to keep us keeping on. Jesus is worthy. He sits ‘at the right hand of the throne of God’ v2. We keep going because Jesus is worthy of praise, glory and honour that He’s not receiving from most of the people we see around us. If this doesn’t motivate me to keep going then I am definitely not here for all the right reasons. Ultimately what we experience in the course of our race, the trials, the risk-taking, the frustration is worth it first and foremost because Jesus is worth it. Other people’s lack of response to the gospel message must not take my eyes off Him. I can still worship; He is always worthy, always wonderful and faithful. Also, if we think this is about us then we’ll either be proud or feel defeated, both of which hinder us from running our race. Jesus understands. v3 exhorts us to ‘Consider him who endured such opposition from sinful men, so that you will not grow weary and lose heart.’ Jesus suffered way more than we ever will. It’s a huge comfort when I’m weary or discouraged to know that Jesus has been here and has ‘shared in our humanity’, Heb 2:14. Have we been lied to? Taken advantage of? Persecuted for doing what’s right? Misunderstood? Had our loving efforts rejected? Jesus knows. We follow the Suffering Servant and He’s promised to be with us. He understands both us and the broken people around us. This has a way of drawing us nearer to Him as we identify even a little with his sufferings and know he has identified with ours. Throw off hindrances and sins. Athletes run or play with just the essentials so nothing gets in the way. Is grumbling hindering our teams? Is self-pity weighing you down? Are we neglecting private prayer and worship? Are we giving in to sexual temptation? If it’s pride let’s see Jesus as worthy and as the one who endured the cross. There’s no room left for pride when we’ve seen Jesus for who He is. It’s a classic strategy of Satan to accuse us and make us feel condemned. V2 says Jesus sat down in heaven. His great work of redeeming us from the power and penalty of sin was done and He’s alive to reign, live in us and work through us. So accept God’s forgiveness anew, remembering we’re free from condemnation and don’t have to carry the burden of sin and failure. I laughed out loud when I first read this from Martin Luther, “When Satan tells me I am a sinner he comforts me immensely since Christ died for sinners.” Ha! The simple fact of the gospel disarms one of Satan’s best tactics every time. Some of our hindrances aren’t sinful but they’re distracting or have become idols, taking the place of Jesus in our priorities. Social media may be doing that for some of us. Or ‘ministry success’. To all these hindrances, temptations and sins I’m learning to say: ‘Jesus is better.’ The temporary reward I feel indulging in these things is like dirt compared to the infinite value of Jesus and the satisfaction he alone can bring. 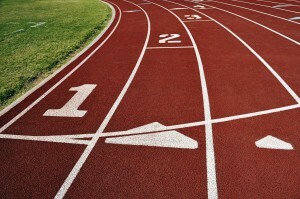 Let’s regularly ask God what hinders us from running the race, confess and repent. Be ruthless and get help. I’ve seen sin lead to people leaving their field of service causing hurt and lasting damage and leading to less ambassadors for Christ reaching the unreached. Stick together. The use of athletic imagery here and in Paul’s letters isn’t supposed to imply we run solo. ‘Us’ appears several times in these few verses along with ‘we’, ‘our’ & ‘you’ (plural). Clearly it’s written to a group exhorting them to do these things together. Having the support of other believers is crucial to staying on course. The encouragement Ellie and I get being a part of a small team and a house church here is immense. Praying together, sharing struggles, helping each other move house, worshipping together. Are you connected regularly with some supportive fellow runners? People with whom you don’t feel you have to pretend? Christian community is also where we remind each other of the glorious truths of the gospel and can confess our sins and get help with the things that are entangling us. Pace yourself. That we are to ‘run with perseverance’ (v1) tells us that it’s going to be hard. And that this is a marathon not a sprint. Knowing this we need to pace ourselves. A number of mission organizations encourage their workers to work only 2/3 of the day. If you’re working in the evening, take either the morning or the afternoon off. Also one person’s rhythm is different from another’s. Things like having young children or living with a medical condition or being older also impact on what’s a sustainable pace for different people. Plan rest days or breaks into the coming months. These are days of much activity in the field of church and mission work, but no amount of activity in the King’s service will make up for neglect of the King himself. The devil is not greatly concerned about getting between us and work; his great concern is getting between us and God. Many a Christian worker has buried his spirituality in the grave of his activity. Our attention easily moves to ourselves, our organizations, our methods, our shortcomings. We wonder if our faith is big enough or how we compare to others. Problems can seem overwhelming. Regularly, intentionally gazing at Jesus brings right perspective and we start to see what could be instead of what is right now. And if we lose our focus on Jesus we have nothing of lasting value to give to the broken world around us. Verse 3 indicates that if we ‘consider him’ we won’t lose heart. The recipients of this letter were facing trouble. We face trouble. It can push us toward Jesus. It must if we’re to keep going. It’s challenging to keep loving & keep serving. We’re not supposed to be able to do this without God. We’re going to need to get on our knees before that difficult meeting, about that awkward relationship, about that broken person who doesn’t seem to be changing. We need vision to keep going. Ultimately Jesus is our vision, over and above whatever particular vision God may have given us for our various different ministries. He’s our source, our sustainer and the giver of our purpose. We can keep running because of who Jesus is and what He’s done. Our sin forgiven, a message burning in our hearts, carriers of His presence, secure in our identity. I’m sure also many of us would testify that ministry vision, ideas and inspiration have come when we’ve been seeking Jesus. Finally, keep an eternal perspective. Heaven is real. Knowing where we’re going changes how we live. Future glory outweighs present suffering for the sake of the gospel. We can face trials, hurt, discouragement, even persecution unto death because we know what’s coming. For the joy set before Him Jesus endured the cross, v2. He knew it was worth it: God would be glorified, we would be redeemed and with Him forever and that coming joy spurred Him on to endure the cross. May both the coming joy of being with Him and the desire that those we serve be there with us spur us on too. The witnesses in verse 1 are the heroes of chapter 11, and maybe 1000s of others since, who have finished their race. It’s like they cheer us on: “Keep going, keep getting up; it’s worth it! Nothing done in Jesus’ name will ever, ever be in vain!” The sacrifices may be great but the reward will be greater.